Last night I ventured out with Lolly to see Nels Cline and Glenn Kotche at the Doug Fir. It’s the first show I’ve seen in… well, a while and it was awesome. It was the first show I’ve gone to where I was late (they actually started at 9pm! ), and the first show I’ve been to where it was easier to see the artists as the show progressed. I think both Lolly and I drew a fair amount of satisfaction from the number of people who left during the show. Nels started the set with some guitar and accessory noises (which we missed most of) and was followed by Glenn doing a solo set, which was the coolest live solo drum set I’ve seen. He used a combination of a small kit, an electronic pad, a sampler, a loop and some really funky cymbals. His Monkey Chant was excellent. The two played a small set together to finish that mixed some great sample looping and perfect guitar control for a rather cool mix of interstellar travel and angry garbage compactor sounds. Stumbled on some Lego models of Portland Sky Scrapers. The city (I assume) just painted crosswalks on each block along northeast Alberta. It’s quite a change considering there were only maybe 3 between MLK and 33rd. Anyway, I’m appreciative since it reminds folks to slow down. Alberta is much more enjoyable as a pedestrian anyway. It’s a wiki for outdoors enthusiasts to share places & waypoints. Sweet idea. I’m working on a map of elevation cross-sections of the state of oregon for my Digital Atlas class. There’s a great utility Profile Toolthat will create a series of shapefiles from a DEM and geology coverage for use in fancy geologic lithography maps. I just wanted to create an elevation profile, so I used the tool without using the geologic identifications and now I just need to figure out how best to explain the concept. This is for a children’s atlas after all. I’m trying out ArcScene to see if there’s a nice way to show the profile lines. I had a little bit of tech support karma pay itself back today when I was helping a befuddled student. I was out of ideas so I simply googled the error message and the answer came up on a page that I created over a year ago. Thank you digital brain. One benefit to not actually being a vegetarian is that when you find flecks of beef in your meal, all isn’t lost. It is a little weird to pay more for a vegetarian meal than the carniternative. I don’t have breakfast as often as I should lately, but I’ve been trying to get better about eating something in the mornings. 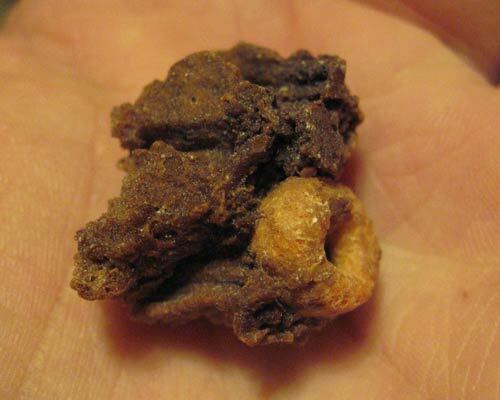 Michelle got some fruity Cheerios recently, and the other morning while pouring a bowl, this fell in. Growing up, I loved the last bowl of cereal because it polluted the milk with goodness. The extra grain and sugar sediment were a treat, especially when it stained the milk some unnatural pink color. So when I saw this hunk, my first reaction was “jackpot!” So, I bit in to it, started crunching, and immediately spit it out. It was compressed dye or something, but the flavor was foul, and my saliva turned an evil sludge brown. All I can figure is this regular cheerio got stuck going through the flavor extruder and backed up with all the dye/flavor gunk. Not quite the prize I was hoping for.